It was the morning after the night before because this was the second performance at this year’s Bayreuth Festival following the gala opening which this year saw the premiere of Yuval Sharon’s new Lohengrin. Anybody who is anybody always seems to turn up for the first night including Angela Merkel for whom the date must be the first to go into her diary every year. Everything had seemed to have been ‘all quiet on the Wagner front’ once again until rehearsals for that Lohengrin began and Roberto Alagna never got on the swan to be there and there was a search for someone to sing the leading role at the last moment – but more about that in my review of Lohengrin’s second performance. Uwe Eric Laufenberg’s Parsifal is now in its third year and it seems to have been quickly forgotten how much was written when it began due to all the various religions he puts on stage and what he does with some of them. That, as well as, several terrorist atrocities – in Germany and elsewhere – in 2016 led to all the heightened security up at the Green Hill which still means all the visitors being bused in from various hostelries in the town and surrounding villages must yomp through a surprisingly disorganised car park before reaching the Festspielhaus. This always reminds me why Wagner built it there in the first place: it was far enough away from Munich and only those most devoted and dedicated to his music would undertake the journey. It’s the wrong language – but not for many of the visitors there – plus ça change, plus c’est la même chose! More significantly after having Hartmut Haenchen conduct his revised Parsifal score there was a new conductor, Semyon Bychkov, who clearly had his own ideas on tempo as a fascinatingly detailed interview in the programme revealed which concluded that ‘there can’t be something like an absolute tempo and everyone involved, the artists and also the audience will shape or feel the tempo – within certain limits, of course’. As the curtains opened there was already something different: previously there was a seated, figure – a dummy obviously – high up in the cupola of the ruined church in warn-torn Iraq we see. I thought in those two earlier years it might be Wagner himself but now it was standing and holding what looked like a shepherd’s crook. I would be very happy to receive the views on others as to what they think this might now represent. We are in roughly modern times and Wagner’s knights seem to be Christian monks in habits and Gurnemanz is their pastor with the appearance of an Imam. They are a charitable brotherhood since during the Prelude we have seen the ruined church as a place of refuge. Soon those we have seen sleeping pick up their beds and leave. Liberating forces are close by and soldiers wander around at times but do not seem that threatening. Centrally there is a large baptismal font where Amfortas bathes and we are supposed to make the connection between him and the image of Christ we have previously seen taken down from a crucifix, wrapped in a shroud and removed to a side chapel. Towards the end of the first act Amfortas wears a crown of thorns and has his side pierced to provide the blood that will renew the brotherhood. For good or ill I cannot remember such a frisson in previous years that this thought-provoking moment now caused. At the point when Parsifal shoots (offstage) the swan, a young child in red T-shirt and short trousers drops dead onstage as if he has been felled by a ricochet. He is taken away and Parsifal comes on with his crossbow and we see the ‘traditional’ stiff white swan. Titurel’s relationship to Amfortas is very much like that of the Pope Emeritus to the current pontiff and he presides over the Grail Ceremony. Kundry, of course, does very little in Act I and is dressed as one of her previous incarnations, Herodias. ‘Zum Raum wird hier die Zeit’ brings a wonderful few minutes of videography from Gérard Naziri when we leave Earth, head out seemingly beyond the confines of our own galaxy before racing back. The glazed tiling of the Act II setting suggests a mosque but is more likely to be a harem. It is presided over by Klingsor who wears a skirt and is first shown attempting to pray towards Mecca. He is holding Amfortas hostage and he remains a prescence – real or imaginary? – for much of this act. From an upper room – with its vast array of crucifixes – Klingsor spies on both Kundry and Parsifal and we later watch him self-flagellating there. Religiously dodgy moments include the crucifix with a phallus-like end that Klingsor brandishes lasciviously and soon the Flowermaidens enter in their burkas but will quickly disrobe to appear as harem girls. Parsifal enters looking like Bradley Cooper in American Sniper and soon loses his combat gear to be bathed by the girls. (I don’t remember Parsifal being stripped so obviously naked by the Flowermaidens before.) Maybe Parsifal and Kundry spent more time together during their pivotal scene than they did before (or is some of this just a fallible memory) – though each still later steps away from it during the other’s big moment. Kundry cradles Parsifal for his ‘ersten Kuss’ and at first he cannot keep his hands off her. He is about to ravish her on a dining table Kundry has set for them when the sight of Amfortas sends Andreas Schager into his Tristan-like anguish of ‘Amfortas! Die Wunde!’ and indeed it is Amfortas who gets to finish what Parsifal started with Kundry! Klingsor eventually interrupts proceedings and relinquishes the spear much too easily to Parsifal that he originally took from Amfortas. Parsifal now has his uniform back on and breaks it to make the sign of a cross with the broken pieces. All the crucifixes we have seen on the upper level fall haphazardly to the stage. Several more years have obviously passed before Act III begins and we are in a smaller even more derelict chapel. The natural world is beginning to reclaim the ruins. Gurnemanz gets all the ‘holy’ water he needs from a fridge and both he and Kundry have aged significantly. He occasionally resorts to using a wheelchair, whilst she is stooped and has a tremor. Parsifal enters clothed in black at what seems the end of a long tour of duty and Kundry washes his feet in a small tin bath. For the Good Friday Music (Karfreitagszauber) young Eco travellers enter and frolic naked under a waterfall at the back. Parsifal absolves Kundry of her sins and she is venerated by future generations. More impressive video shows the tolling of a bell and the baptism in rushing waters of Winifred and Wolfgang Wagner for the first time, as well as, Richard as before! We return to the original Act I church setting and Titurel’s coffin is brought on. Amfortas refuses to shed blood despite the protestations of his knights and a throng of devotees and zealots of – what looks like – most of the world’s major religions. Parsifal – now dressed as an American evangelist – brings the spear back to be thrown into the coffin and all present repeat this with their religious clothing and objects used in worship. As I have commented before, Uwe Eric Laufenberg is possibly showing us that a community can renewed itself by coming together because of a shared hope and optimism for the future, and this should not need any belief system about a supreme being. Sadly in 2018 this ideal world is as far away as ever! At the very end as everyone leaves the stage the houselights go up as if to ask everybody who has just watched this Parsifal: ‘Weisst du, was du sahst?’ (‘Do you know what you saw?’). Of course, this is the question Gurnemanz posed to Parsifal at the end of Act I. The singing throughout reminded me of what I was told apocryphally about Bayreuth before coming there the first time in 1989: it was said that – because of the design of the theatre – from any seat you could see and hear everything clearly. Naturally, I subsequently found this not to be true, especially about the view of the stage. Nevertheless, in a seat very similar to where I usually sit the orchestral sound was sublime and the singing of the soloists and chorus was loud and clear to a degree I somehow didn’t recall from previous years. This was a feature throughout my time there this year. It is, of course, difficult to compare this Parsifal with all the others I have seen there during nearly three decades but Semyon Bychkov – conducting at Bayreuth for the first time – brought a solemn profundity notably to Act I. For the Prelude it was a case of ‘Zum Raum wird hier die Zeit’ as the music stopped but you still felt an inner pulse even if time – or rather music – had actually stood still for what seemed like an eternity. Act II was as intense and dramatic as I can remember experiencing and – thanks to Bychkov and the incomparable orchestra – the final act continued the stranglehold on my senses and critical faculties such that it was as if – like many around me – I was seeing Parsifal for the first time at Bayreuth, or anywhere. As far as timings are concerned Bychkov’s Parsifal was surprisingly only about 15 minutes longer than Haenchen’s. The chorus were in their usual incandescent form throughout. Günther Groissböck’s role debut as a wise and paternalistic Gurnemanz was another notable success for this fine singer. He made light of the difficulties of the part singing with excellent diction and due care for what his words meant. In another role debut Thomas J. Mayer was more at ease vocally as Amfortas than recently as Telramund at Covent Garden and his great cry of ‘Erbarmen!’ was every bit as heartfelt and harrowing as it must be to elicit our compassion for his character’s suffering. Elena Pankratova acts especially demented in Act II because of Parsifal’s rejection and held on to ‘lachte’ as if she was Siegmund summoning Walse! The volume she produced however continues to be ideal for Andreas Schager’s committed acting and impassioned singing as Parsifal. As hinted above he often sounds more like Tristan than the ‘usual’ Parsifal though he found more radiance in Act III for ‘Nur eine Waffe taugt’. 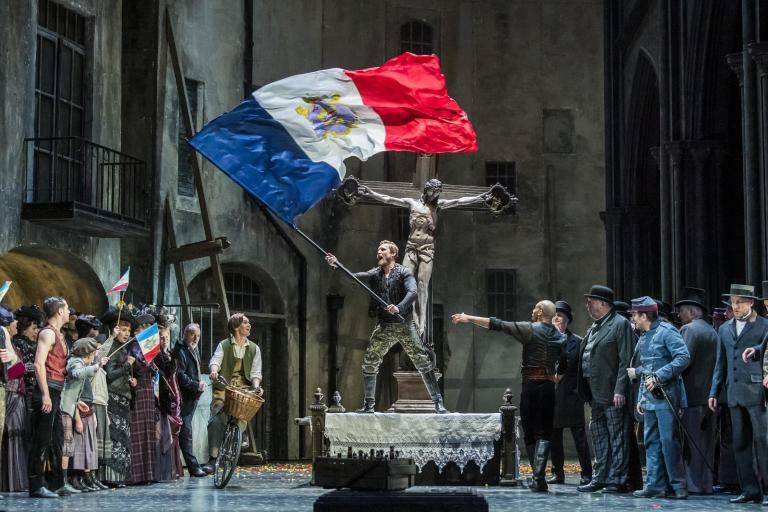 Yet another role debut saw Tobias Kehrer bring considerable gravitas to Titurel and Derek Welton was marvellously unhinged with incandescent rage and malice as Klingsor. The Flowermaidens – led by Ji Yoon – once again had delightfully well-balanced voices and danced and sang with their usual enthusiasm.